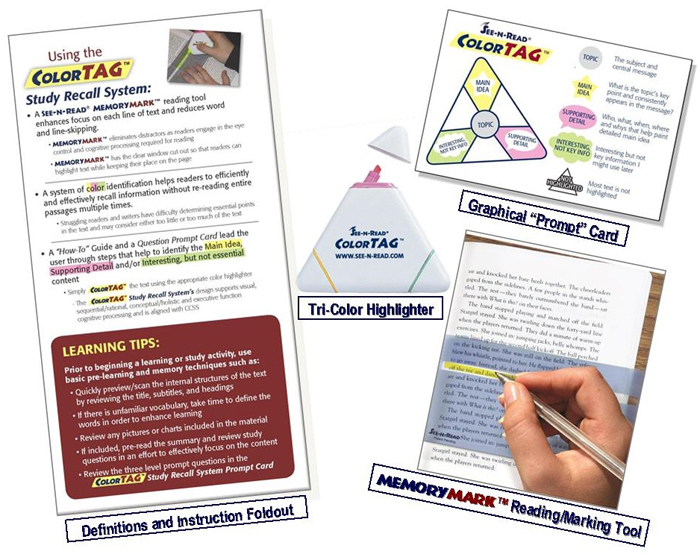 Assistive tool kit provides a research-based, structured, color-based process and study aids to help users identify the Main Idea and Supporting Details in text when reading or writing. Supports comprehension, recall, retention and learning by helping readers and writers to identify and focus on the main idea in a passage of text. 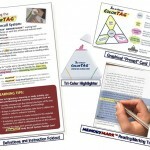 Teacher 10-pack includes 1 tri-fold complete process description and definitions, plus 10 each of all other components. 10-Pack includes: 1 tri-fold card with definitions and detailed process descriptions (for reading and writing), 10 graphical Prompt Cards. 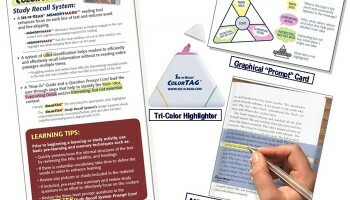 10 tri-color highlighters and 10 MemoryMark™ reading tools.